Xeno Müller makes an overview of the 2013 World Rowing Championships men’s eight final race. 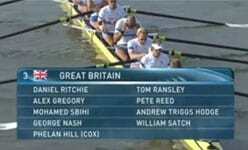 While comparing the British with the Germans (and with other teams) at the World Rowing Championships, there were many differences in technique. One of the key features was the body movement. He says that knees should go down and upper body should move away afterwards. While the Brits had this under control, the Germans moved their shoulders away from the stern while the knees hadn’t really descended yet. About this and much more in the video below.